I baked Vanilla-Brown Butter Madeleines from Dorie’s Cookies by Dorie Greenspan for the Tuesdays with Dorie group this week. This is such an easy recipe to make, I ended up making these two days in a row! I had to make these twice because I learned the hard way not to turn out freshly baked Madeleines onto a cooling rack because they’ll get grid marks in them! This is a photo of the Mads with grid marks. They were delicious, though! The best way to learn is from your mistakes, right? My second batch was grid-free and equally delicious as the first batch! I love the smell of butter browning. It’s a nutty smell, but a nice buttery nuttiness that you need to smell to fully understand. Adding vanilla to the browned butter added to the wonderful aroma and so much flavor to the mads. I took a batch of these to work and people were asking if the bumps on the Madeleines meant I over-baked them. They were saying that the ones they buy from the store don’t have those bumps, so I told them those bumps are actually desirable. This recipe is definite keeper. If you have the Dorie’s Cookies cookbook, this is definitely something you need to try. Dorie’s instructions are very easy to follow; she sets her readers up for success! Vanilla-Brown Butter Madeleines recipe is on page 316 of Dories Cookies by Dorie Greenspan. This is my favorite recipe for Madeleine for sure. This one is a keeper as far as I’m concerned. Your madeleines look great with their bumps! I got the cooling rack marks on mine too, glad to know I am not alone. How nice that your co-workers got to enjoy your baking. A keeper recipe for sure. they look fantastic! i don’t think anyone would have called you out on grid marks, but we are own worst critics, i guess. haha. i love the vanilla and browned butter combo…so tasty. 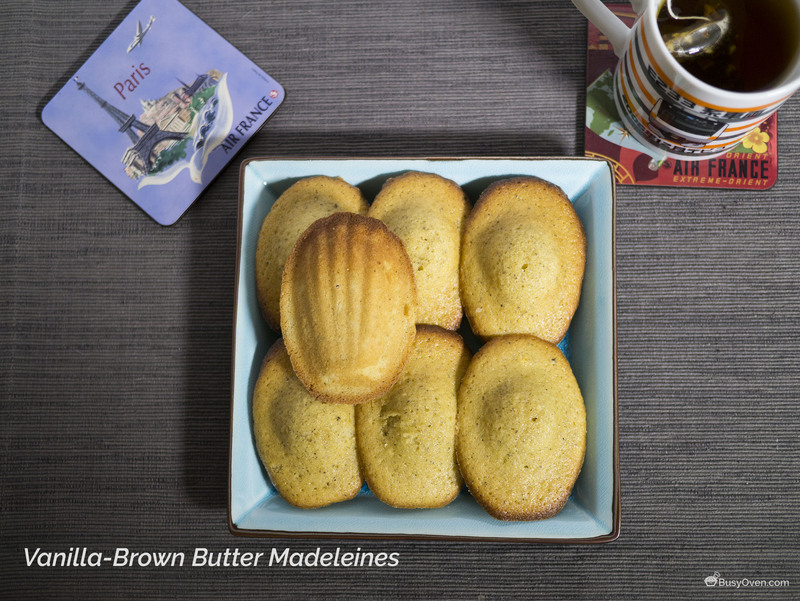 Your madeleines look terrific – both batches!